So this is my first foray into the written world of Star Wars. I initially picked this up because I loved Rogue One – its now my second favorite Star Wars movie (second only to The Empire Strikes Back) – and I didn’t want to have to wait until the movie came out on DVD to spend more time with these characters. I needed more of them in my life. And I don’t regret it one bit – I laughed and cried and didn’t want it to end. 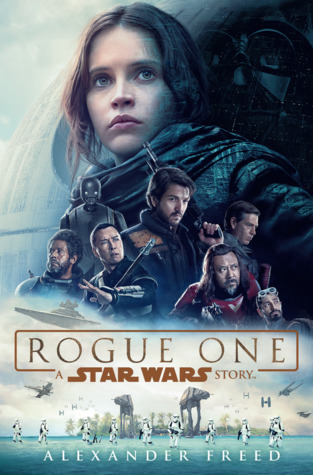 Rogue One: A Star Wars Story follows the band of misfits who risk everything to steal the plans to the Death Star – a horrible new weapon designed by the Empire. Its a planet killer. And, its destruction is the Rebellion’s only hope at winning its fight against the Empire. Anyone who is familiar with the original Star Wars trilogy own’t be surprised by the plot. But, it doesn’t make the story any less of a ride because it fills in the gaps in the canon and introduces new story lines and characters. The pacing is fantastic and the action is described in such vivid detail. But, hands down the best part of this story are the people. They are flawed, disillusioned, and even a little broken. They’ve done bad things for the right reasons and are looking to this mission as a way to make their lives mean something. Jyn Ero is the daughter of the architect of the Death Star and a woman who has given up the fight; Cassian Andor is a battleworn rebel fighter whose belief in the Rebellion is the only thing keeping him going; K-2SO is a reprogrammed Imperial droid loyal to Cassian; Bodhi Rook is a Imperial defector looking to pass on information to the Rebellion; and Chirrut Imwe and Baze Malbus are former Guardians of the Whills who follow Jyn into the fray. What I loved about this book is how much insight you get into the characters – while you can watch them on film and follow the story – the narration in the book allows you to get inside their heads. You learn about their motivations and thoughts: Jyn grappling with her past and her father’s legacy, Cassian trying balance his orders and what he knows to be right, Chirrut and Baze’s understanding of the force and its purpose, and Bodhi’s decision to defect and his fight to make up for the things he’s done. And, it also makes certain scenes even more emotionally impactful – especially what happens in A New Hope. It makes the human cost more real – and the Death Star more frightening. But, there is humor too. K-2SO’s one liners are fantastic, and the banter between Chirrut and Baze speaks to their deep and enduring friendship. Ultimately, this books is a testament to the strength of the Rebellion and the selfless actions of the individual fighters who are willing to sacrifice everything to destroy the Empire once and for all. I didn’t know there was a book! I must read this immediately. Yes, yes! Its so fantastic – if you love Star Wars/Rogue One, you’ll love this!